“People talk as if there is something wrong about Lord Brentmore. Something about his past." The Marquess of Brentmore walked out of the library of his London town house and wandered into the drawing room. He’d agreed to consider his cousin’s scheme. What the devil had he been thinking? He strode to the window and gave a fierce tug at the brocade curtains. Why hang heavy curtains when London offered precious little sunlight as it was? One of many English follies. What he would give for one fine Irish day. At times like this, when restlessness plagued him, his thoughts always turned to Ireland. He could never entirely banish his early years from his mind, no matter how hard his English grandfather, the old marquess, had tried to have it beat out of him. He stared out the window, forcing his mind back to the weather. The sky looked more grey than usual. More rain coming, no doubt. A young woman paced in Cavendish Square across the street. Something about her caught his eye and captured his attention. She brimmed with emotion and seemed to be struggling to contain it. He felt it as acutely as if those emotions also resonated inside him, as if he again waged a battle with a fiery temperament. The Irish inside him, the old marquess always told him. Were his thoughts to always travel back to those days? Better to attend to the pretty miss in the square. What was she doing there all alone, looking as unsettled as he felt? She stirred him in a way the countless ton’s daughters who attended the Season’s balls and musicales failed to do. Foolish girls, who gazed at him hopefully until their mamas steered them away, whispering about his reputation. Was it his disastrous first marriage those mothers objected to? he wondered. Or was it the taint of his Irish blood? The title of marquess did not make up for either one. He did not want any of it. Not the Season. Not the marriage mart, certainly. He’d done that once and look where it had led him. No, he had no wish to be stirred by any woman, not even a glimpse of one, pacing across the street. He had work to do. He pushed away from the window, but, at that same moment, she turned and the expression of anxious anticipation on her face cut straight to his heart. He could see her eyes were large and wide, even from this distance. Her lips looked as if kissed by roses. Dark auburn hair peeked from her trim bonnet, and the blue muslin of her skirt fluttered in the rising winds, showing a glimpse of her slim ankles. He took in a quick breath. She gleamed with expectation. Passion. Hope. Fear. She roused him straight from his heart to his loins, something not easily done, certainly not since Eunice him on all women. Was she waiting for someone? A man? Was this to be some forbidden tryst? Brent bit down on a stab of envy. Once he would have yearned to have such a young lady flaunting respectability…to meet him. He spun away from the window, dropping the brocade curtain again to block out the tempting sight of her. What foolishness. Having endured a marriage from hell, he well knew how easily passion could lead to misery. Brent marched back to the library and the piles of paper on his desk. He riffled through his correspondence. With one hand he lifted a letter and re-read the news from Brentmore. Parker, his man of business, was there taking matters well in hand. The children’s elderly governess had died suddenly. Parker had been there and was able to attend to her affairs. He’d seen to her funeral and burial, but, damnation. How much were two young children supposed to endure? First their mother’s death…now their governess? His children had suffered too much in their young lives. Perhaps his cousin was right. Perhaps it was time for him to consider marrying again. Eunice had been dead a year and the children needed a mother to watch over their care, to handle matters about governesses and such, to make certain their lives were worry-free. Brent knew nothing of children. Eunice had taken charge of them and resented his interference. He’d been a virtual stranger to them. His brief visits to the children since Eunice’s death had been almost formality. The governess always assured him she had the children under excellent control. Who was Brent to question her years of experience? When he’d been a boy, the old marquess had left him in the care of rather harsh tutors and then sent him off to school. He hardly saw the man until he’d returned from his grand tour. From what he could tell, other peers similarly uninvolved in the care of children. Brent pressed his fingers against the smooth dark wood of his desk. He always felt sick inside when thinking of his children and how they would suffer for the sins of their parents. Better to go back to the drawing room window and pine over a passionate young woman awaiting her paramour, than agonize over what he could not change. His mind went blank. An appointment? Ah, yes. Sometimes luck actually shone on him. At White’s last night, he’d overheard someone saying he had a governess to fob off on someone. No longer needed her and wanted to settle her elsewhere as soon as possible. Brent told the fellow who had it been? to send the woman to him today. He wanted this problem of the children quickly solved, even if he had no clue what to look for in a prospective governess. “Send her in.” Brent put down the letter and sat behind his desk. “Miss Hill, m’lord,” Davies announced. Brent raised his eyes and every sensation in his body flared. Standing before him was the passionate young lady he’d spied in the square. She took two steps towards him, close enough for him to catch the faint scent of lavender and to see that her large, wide eyes were startlingly blue and even more vibrant than the blue of her most un-governess-like dress. Fringed with long curling dark lashes, those eyes gazed at him with the same hope and fear he’d witnessed from the window. Up close she did not disappoint. With skin was as smooth and flawless as a Canova statue, she bloomed with youth. Her rose-colored lips were endearingly moist. The lovely swell of her breasts. Worst of all, her obvious nervousness piqued tender feelings inside him, a much greater danger to him than his body’s baser response. “Anna Hill, sir.” She made a small curtsey. His gaze seemed unable to break away from how gracefully she moved, the expectant brightness in her eyes, the rise and fall of her chest. She was no governess. That was apparent with a glance. She was quality, some society daughter all dressed up to impress. She lifted her chin in a show of bravado and he broke his gaze, lowering it to the papers on his desk. Two spots of red tinted her cheeks. Damnation. He did not want to care about upsetting her. She lifted herself to a dignified height and walked haughtily to the door. Yes, she was definitely quality. Brent rose and impulsively walked towards her, closing the distance in a few long strides. She stood her ground, fixing her eyes on his approaching form. He put his hand on the door, whether to close it or force it open, he did not know. It brought him inches from her. But she suddenly seemed small and vulnerable. That’s who it was! Lord Lawton had set up this interview. Good God. This was the governess. Brent had consumed a lot of brandy that night. He did not remember much of what Lawton explained, only that there was a governess when he needed one. “You tell me, Miss Hill.” He pushed the door shut and stepped back a more respectable distance. Brent shrugged. His lineage was nearly as undesirable. His mother had been as poor as an Irish woman could be. Brent had spent his early years on his Irish grandfather’s tenant farm in Culleen. Until his English grandfather took him away. An uncle he’d not known existed died and suddenly Brent was heir to a title he’d known nothing of and sent to a land he’d considered the enemy’s. His fingers grazed hers as he took the paper. He noticed that her glove was carefully mended. She straightened her spine, as imperious as a lady patroness of Almack’s. “Why do you regard me so?” Her voice quivered slightly. Good God, he’d been contemplating seduction. The governess has been a popular figure in historical romance, perhaps beginning with literature’s most iconic governess heroine, Jane Eyre. 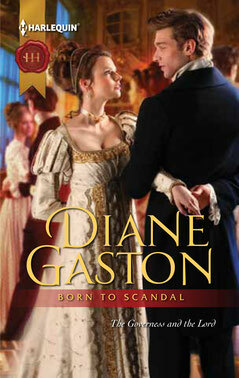 Born to Scandal is my homage to Jane Eyre, a book read in my youth with all the impact it must have had when it was first published in 1847 under the pen name Currer Bell. The life of an early nineteenth century governess could be similar to Emma’s Miss Taylor–paid well, treated well, valued as important. A governess’s salary could be as much as 200 pounds a year, but often it was as little as 20 pounds or, in the worst cases, no salary at all, just room and board. Often a governess had no ability to save money for retirement. When her teaching days were over, her circumstances became even more dreadful. A governess was expected to come from a respectable family with a social background similar or better than the family employing her. But, of course, her need for employment meant that her status was unequal to her employers. Neither was she considered a member of the servant class. Her situation in a household could, therefore, be a lonely one, fitting in neither Upstairs nor Downstairs. Her reputation had to be spotless. No scandal could be attached to her name or she might be seen as corrupting her charges rather than instructing them in moral behavior. She had great responsibility for the children in her care, both for their education and for their behavior, but she might not necessarily have authority over them. Always that right belonged to the children’s parents, who she must please or be let go and not given a good reference. A governess’s grim life makes her a perfect heroine for a Cinderella story. Who would not cheer such a heroine for earning the love of the hero and achieving a happily ever after? In Born to Scandal, Anna Hill is such a heroine. Will the Marquess of Brentmore be her Prince Charming?